Canvas Grade C mechanical grade, NEMA C, or Canvas Grade C, consists of a cotton canvas fabric and general-purpose phenolic resin. As a whole, it is easy to machine and operates with less noise than metal. 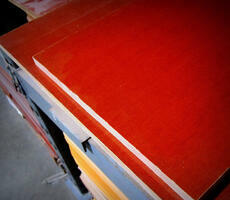 In addition, this material is not as abrasive as fiberglass alternatives when used in wear applications. Since it does not spark when struck, it can be used in explosion-proof environments.